is a non-profit, pro-health organization. Our goal is to save lives through public awareness regarding the hazards of tobacco use, especially when approaching and in enclosed public places. We accomplish this by advocating public policy which promotes a more healthy, smoke-free society. We believe that all individuals should have a healthy smoke-free workplace and home (including those living in multi-unit housing). No one should have to be exposed to drifting second-hand smoke in their homes or on their jobs. "No one should have to choose between their health and their job." 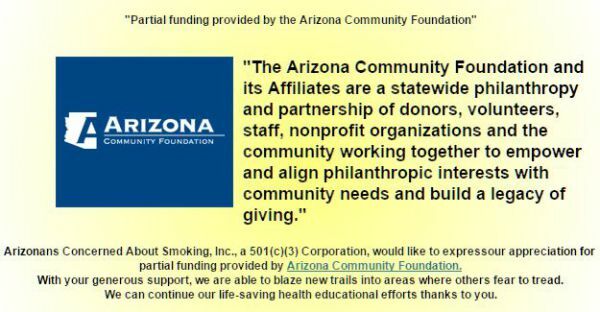 We also support and highly encourage promotion of outdoor "Tobacco and Smoke-Free Campus policies (including no e-cigarettes)" throughout the State and Nation, at Institutions of Higher Learning, Parks, Sports Arenas, Shopping Centers, Performance and Outdoor meeting venues, Public settings, wherever people gather together, as well as work-places. We are inspired and motivated by the "Smoke-Free Society in the United States" challenge of Former Surgeon General of the United States, C. Everett Koop.